Sleep is extremely important for overall health! Your Biostrap Dashboard shows you a summary of how many hours and minutes you slept, plus additional data to give you insight into how well you slept. Below the SLEEP tile, you'll see a percentage that represents “Percentage of Daily Sleep Goal” achieved on the current day. Click anywhere on the “SLEEP" tile on the dashboard to view Sleep details for that specific session, as shown below. The large number shown in circle displays total hours of sleep (Light + Deep sleep hours). Horizontal segments shown in the graph represent AWAKE, LIGHT-SLEEP and DEEP-SLEEP stages of this particular sleep-session. When scrolling down, you will see various data points for this specific sleep-session, as shown below. To view a “Sleep Summary” for previous 7 days, you can click "Week" as seen in the screenshot. 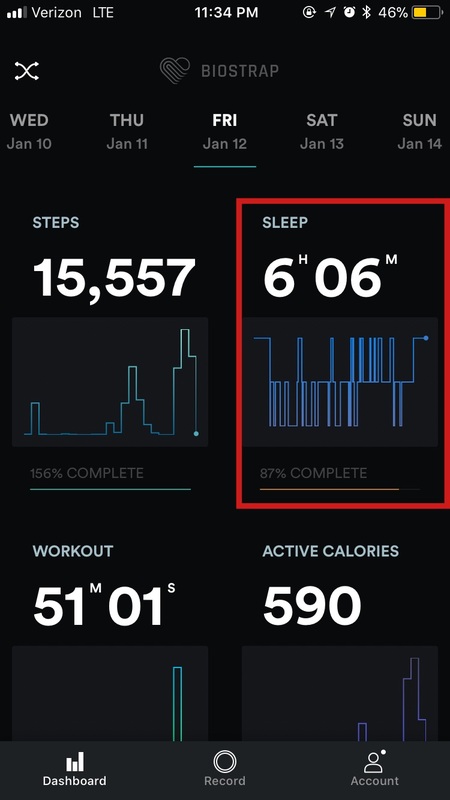 Number shown in the circle is average sleep (6:50 Hours) during last 7 days. When scrolling down, you will see various data points for 7 days of sleep sessions.